What can I say about the Supermarine Spitfire that hasn’t been said before? Not much. 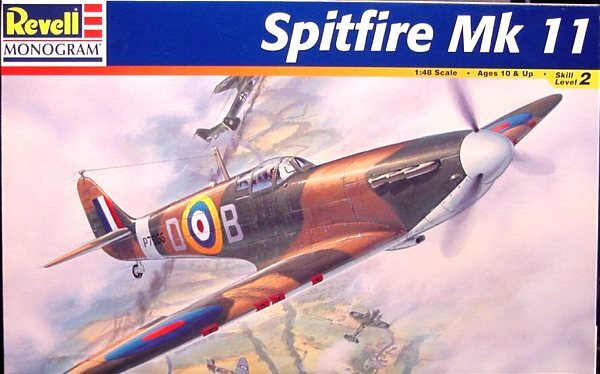 For me the Spitfire represents my favorite movie, The Battle of Britain, where it battled ex-Spanish Hispano Ha 1112 M-1-L Buchons and licensed built He 111 by Casa with Rolls-Royce Merlin engines. The movie brings back memories of a little me unable to understand the dialogues, not yet knowing a word of English, but enough of that. The Spitfire was the aircraft that helped stopped the German onslaught in 1940, but the biggest share of work went to his older companion, the Hawker Hurricane. The kit comes in a big box that contains one bag with 3 grey styrene sprues and a clear one, along with the decal sheet and the instructions. 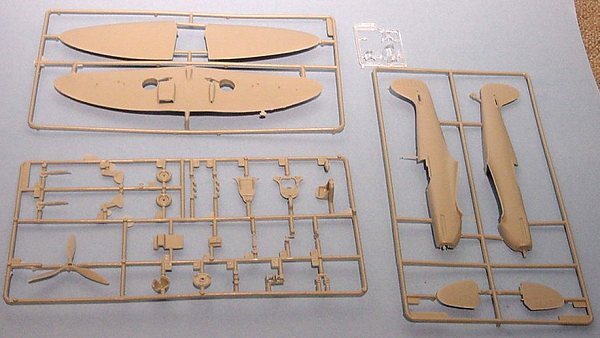 The aircraft is molded in standard grey styrene and is detailed with raised panel lines. Also, the parts have a lot of flash which will require a thorough clean up. The cockpit is simple but adequate, with a dash, a rear bulkhead, pedals and a stick, but no floor, which is actually made from the bottom of the 3-part wing. The canopy features small framing and can only be posed closed. The wheel wells are Spartan, so scratchbuilders will have a ball here spicing it up. The decals are well printed and appear thin, so they might be usable. You have the choice of two machines, the first one being Douglas Bader’s D*B in November 1940 and the second one being PO Lumsden’s NK*K from 118 Squadron in 1941. Both versions call for dark earth over dark green in the Battle of Britain camouflage pattern. Revell also provide you with the little red fabric patches to cover the machine guns ports. 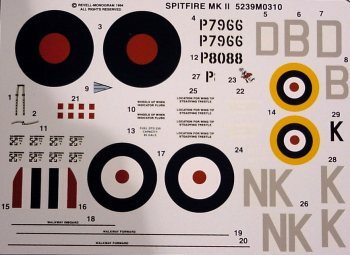 If I base myself on Monogram’s Typhoon, the kit should be an easy build, maybe not as accurate as Tamiya’s Spitfire, but for the price, it’s good value.